The twelveth edition of one of Singapore’s most-recognised advertising awards, the SPH iink Awards, is back. Organised by Singapore Press Holdings Limited (SPH), the SPH iink Awards 2016, with its theme “Your Name in Lights”, is seeking to reward advertising practitioners who come up with the most creative executions across SPH’s wide spectrum of media platforms – print, digital, radio and out-of-home. 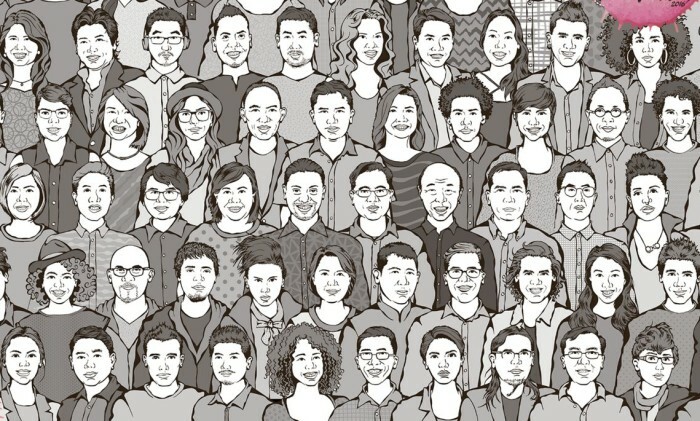 The campaign broke in The Straits Times & Business Times on 21 April with a creative “caricature” execution featuring ad agency professionals. These caricatures are hidden amidst a sea of faces and the only way to “discover” the talents is through the SPH AR [Augmented Reality] app. With this app, readers can use the cameras on their mobile device to scan the advertisement and enjoy the pop-ups featuring the creative folks from the industry. The SPH iink Awards invites all creative and media agencies, advertisers and other advertising-related organisations are invited to submit their entries comprising advertisements they have worked on which are published in any of SPH’s 19 newspaper titles and other media platforms for this year’s Awards. Points will be allocated to the winners and finalists of each category. The entry that scores the highest number of points from the judges will be named the overall Grand Prix winner. The highest scoring agencies across all categories will be crowned the iink Creative Agency Of The Year and the iink Media Agency Of The Year, respectively. A successful advertisement or campaign must connect well with its audience. Shortlisted advertisements from quarterly-run Readers’ Choice Contests will be put up for readers to vote as the winner of the Readers’ Choice Award. To be eligible for the SPH iink Awards, entries must have appeared in at least one of SPH’s media platforms during the period of 16 May 2015 to 15 May 2016. The submission deadline is 15 May 2016. The winners of SPH iink Awards 2016 will be announced at a gala event in July. Advertisers winning the Gold award from Categories A (A1 – A5) and E, as well as the Grand Prix winner, will each receive a full page advertisement in either The Straits Times or Lianhe Zaobao. Advertisers winning the Gold award from Category B (digital) will receive $30,000 worth of media credits. The winning advertisers from Category C (radio) will each receive $10,000 worth of airtime. Advertisers winning the Gold award for Category D (Out-of-Home) will receive $35,000 of digital airtime. All top winners will also be given the limelight and featured in the respective category’s platform. The gold award-winning teams will also be featured on the media platforms in their respective categories, namely SPH newspapers, digital, radio and out-of-home platforms. More information and entry kit can be found at www.sphiinkawards.com.sg. Are marketing processes getting leaner? In its first-ever collaboration with Marvel, 7-Eleven will unveil a wide-ranging campaign from in-store promotions, cinema and out..